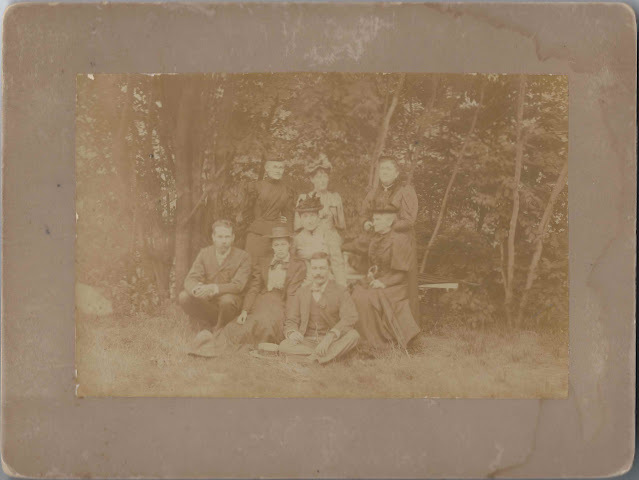 19th century photograph of eight people gathered at Marblehead, Massachusetts. Six of them are identified on the reverse, perhaps in the handwriting of each. 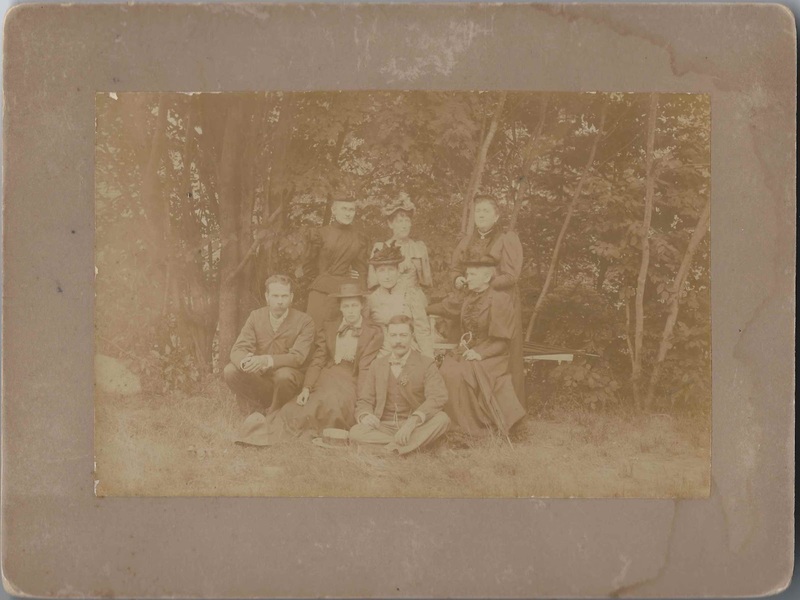 Based on the identifications, I think this may have been a group involved with the First Church of Newbury, Massachusetts, or the American Home Missionary Society. F. W. and L. H. Sanborn may have been Rev. Francis Wood Sanborn (1852-1902) and wife Elizabeth H. (Bateman) Sanborn (1851-1920), presumably "Lizzie". Rev. Sanborn was pastor of the First Church of Newbury, Massachusetts from about 1892 to about 1896, which was the likely time frame of the photograph. A. M. B. Little may have been Adeline M. B. Little, born 22 July 1845 at Everett, Massachusetts, daughter of George Little and Maria Jane (Brockway) Little. I found her name in a 1900 issue of the American Home Missionary, when she was living at Newbury, Massachusetts. 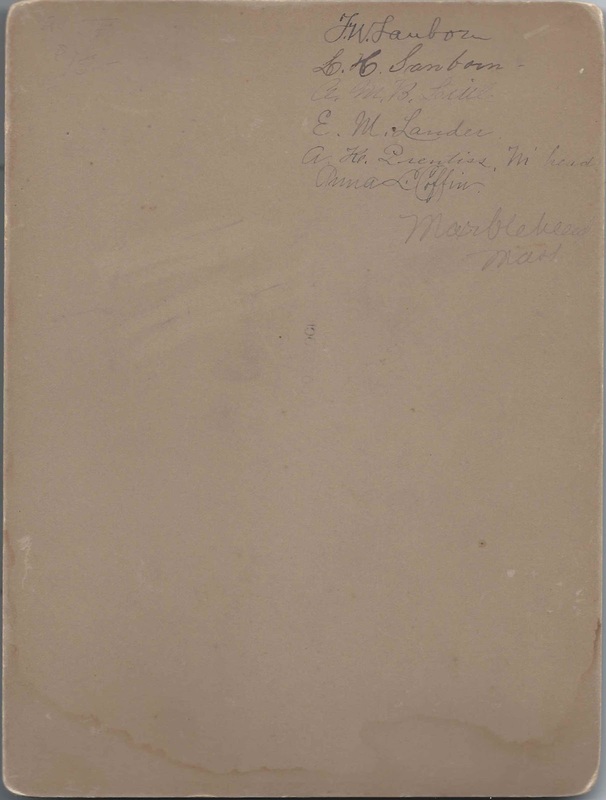 E. M. Lander may have been Emma M. Lander, born about 1850 in Massachusetts, daughter of Henry A. Lander and Anna P. (Clark) Lander. Her family lived at Newburyport, Massachusetts. Emma married Charles H. Andrews at Newburyport, Massachusetts, on 11 September 1906. A. K. Prentiss of Marblehead may have been Amy K. Prentiss, born about 15 March 1837, daughter of Caleb Prentiss and Hannah (Lecraw) Prentiss of Marblehead, Massachusetts. Amy died 27 March 1918. Anna L. Coffin may have been the teacher Anna Lapsley Coffin, who was born at Philadelphia, Pennsylvania on 17 July 1838, daughter of Joshua Coffin and Anna (Wiley) Coffin, who were born at Newburyport, Massachusetts, and Philadelphia, Pennsylvania, respectively. Anna Lapsley Coffin died 25 March 1907 at Newburyport, Massachusetts. Some of Anna's papers are included in the Chase Collection, archived at the University of Florida. If you have corrections to the information above, theories about the identities of the other two people and/or which people are which, please leave a comment or contact me directly. Thanks!